UnitedHealth Group's decision to pull out of most of the Affordable Care Act's insurance exchanges created a big headache for the Obama administration, but the reality of the situation is a lot more nuanced than it might appear. Many experts still believe the insurer's self-induced exchange flop doesn't portend a broader crisis. However, it's clear the exchanges have not stabilized as quickly as predicted for insurers or consumers. Policymakers need to figure out how to entice younger, healthier people to buy coverage and how to make the products more appealing and functional for consumers. “I don't think we'll reach the death spiral of Obamacare,” said Michael Morrisey, a health policy professor at Texas A&M University, referring to the theory in which mostly sick people buy health coverage, thus forcing healthy people to drop their plans because premiums get hiked. “But there are clear issues of the claims experience in the risk pool,” he said. UnitedHealth will exit at least 24 of the 34 states where it sells individual ACA plans, Bloomberg reported. The Minnetonka, Minn.-based insurance and health services giant, which barely made a footprint in the exchanges in the inaugural year and is still a highly profitable company, estimated its losses on individual ACA plans will surpass $1 billion for 2015 and 2016. “We will remain in only a handful of states, and we will not carry financial exposure from exchanges into 2017,” UnitedHealth CEO Stephen Hemsley told investors. Nationally, UnitedHealth's exits won't cause the ACA to implode. A Kaiser Family Foundation analysis found widespread UnitedHealth departures will have only a “modest” impact on competition and premiums, though more so in rural areas. The company, which has almost 800,000 ACA members, or 6% of the exchange population, has not been particularly competitive on price, which is a leading metric for exchange shoppers. Few believe other large insurers will follow UnitedHealth. Yet the exits raise an important question: How much longer can insurers tolerate red ink? Indeed, multiple insurers across the country have hemorrhaged money in the new individual marketplaces, including most of the ACA's co-ops and many of the Blues carriers. Blue Cross and Blue Shield of Alabama, by far the largest insurer in the state, lost $170 million on the ACA exchanges in 2015. The insurer would have been profitable had it not been for heavy individual-market losses. Health Care Service Corp., the Chicago-based parent company of Blue Cross and Blue Shield plans in Illinois, Texas and three other states, cumulatively lost more than $2 billion in 2014 and 2015—roughly double UnitedHealth's ACA losses. HCSC has replaced many of its broad provider networks with narrower HMO plans to control costs. Few believe other large insurers will follow UnitedHealth's lead. Yet the exits raise an important question: How much longer can insurers tolerate red ink? Deficits have mounted as many people with costly health conditions raced to sign up for coverage, resulting in what health economists say is early evidence of adverse selection. But it's also evidence the ACA is addressing a problem it explicitly sought to reverse. Those enrollees had been denied coverage or found it unaffordable for many years because of their poor health. The ACA has undoubtedly helped the poorest, sickest and most vulnerable citizens access health insurance, bringing the national uninsured rate to a historic low. More than two-thirds (68%) of the 9.6 million people who chose a 2016 health plan through the federal HealthCare.gov exchange could have selected a plan with a monthly premium of $75 or less when factoring in subsidies, according to HHS data. People who make up to 400% of the federal poverty level are eligible to receive subsidies as tax credits. People who earn between 100% and 250% of the federal poverty level and select a silver plan also are eligible for cost-sharing subsidies that lower their copays and deductibles. That coverage, along with Medicaid expansion, has protected low-income people from loads of potentially ruinous medical debt. But even a premium of $75 a month could strain the pocketbooks of those living on the edge of poverty. And middle-class people earning 400% of poverty—$47,520 for one person or $97,200 for a family of four—must shoulder the entire cost of coverage on their own or pay the law's tax penalty. Many have chosen the latter. The Kaiser Family Foundation's marketplace calculator shows a family of four with a household income at 400% of poverty will pay an average of $863 a month this year for a silver plan, all without any federal assistance. Depending on where people live and how much premium rates go up for 2017, brokers and analysts predict families with unsubsidized coverage could easily be paying more than $1,000 a month, in addition to managing high deductibles and narrow networks. These problems, he added, would exist regardless of what UnitedHealth decided to do. People ages 18 to 34, who are less costly to insure because they generally need less healthcare, make up 28% of ACA enrollees. 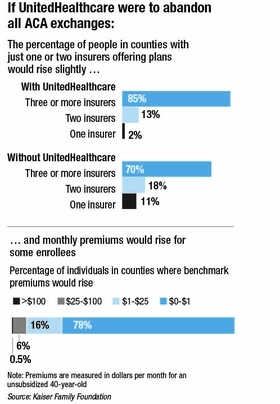 Most observers believe that number needs to be around 40% for truly stable premiums. “You have to have the healthy population to offset the sick population,” said Dan Howell, a partner at Invoyent, a consulting firm that works with health plans. UnitedHealth's announcement that it will bow out of many exchanges has created consumer concern in some markets, but several quickly affirmed their commitment. Security Health Plan, a provider-owned plan in Wisconsin, has 30,000 ACA enrollees, making it one of the largest exchange plans in the state. John Kelly, Security's chief marking and operations officer, said Security recently fielded calls from people wondering if the insurer would follow UnitedHealth's lead. It won't.